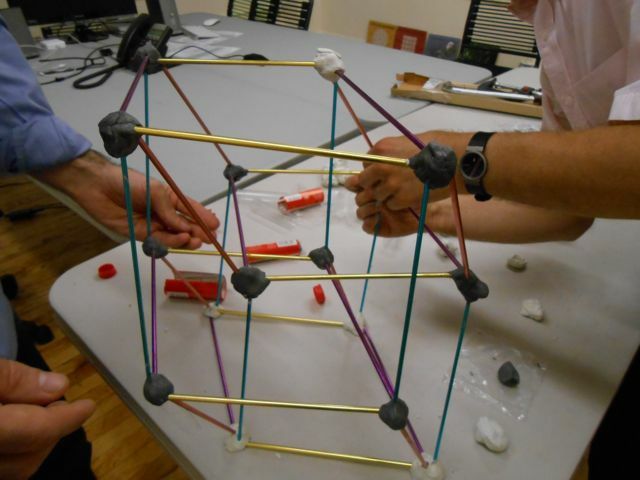 There has been lots of making going on at MoMath lately, which we’ll take a look at over the next few posts. 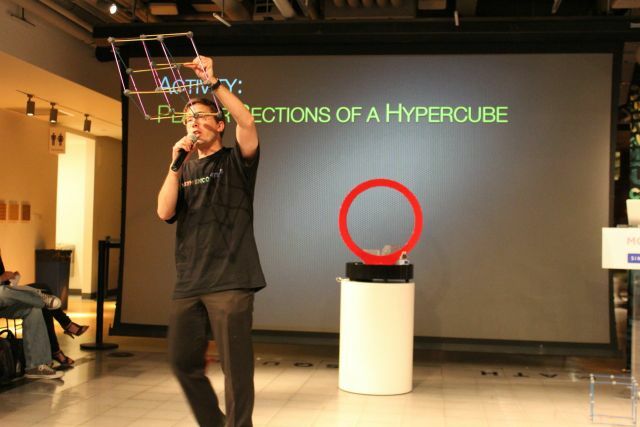 Recently, one of our Math Encounters speakers needed a projection of a hypercube into three dimensions as part of a demonstration. So we used Great Stella 4D to make a nice projection in general position, in which no two vertices coincide in three dimensions, and then used the measuring tool in the program to get the edge lengths. As you may recall, a hypercube has 32 edges, which break down into four groups of eight parallel edges each. All of the edges in each group project to the same length in three dimensions. In our case, the edge lengths came out to 7 3/4″, 7 1/2″, 6 7/8″, and 6 3/4″. 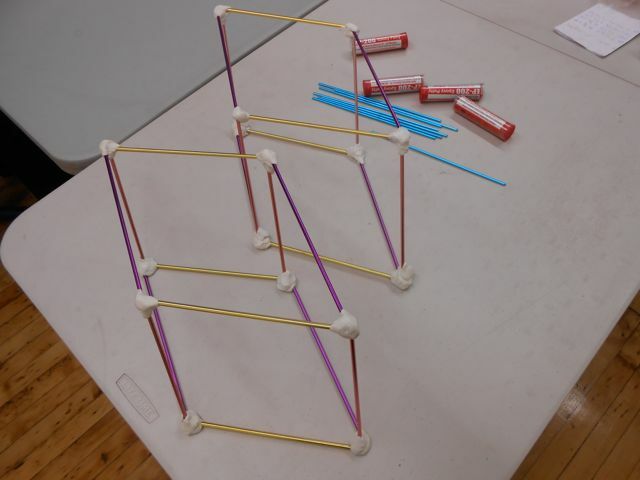 The next thing is to assemble the hypercube. 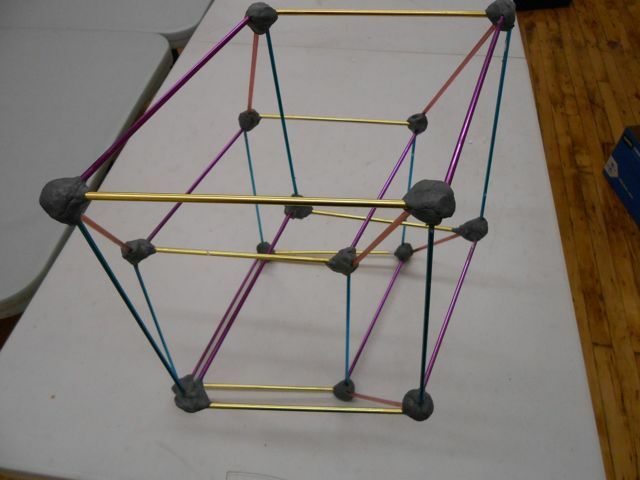 The idea is to use a temporary binding for the vertices until the whole hypercube is in place, and then replace the vertices one at a time with epoxy putty which will harden into a permanent rigid binding for the model. 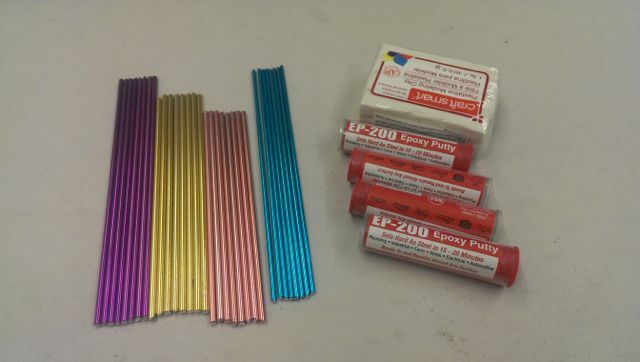 For the temporary bindings, we chose a plasticine, but other possibilities include styrofoam balls, or even Model Magic compound — see below for a caveat on the temporary material. Finally, take the remaining color and join corresponding vertices of the two cube projections to form the single hypercube projection. 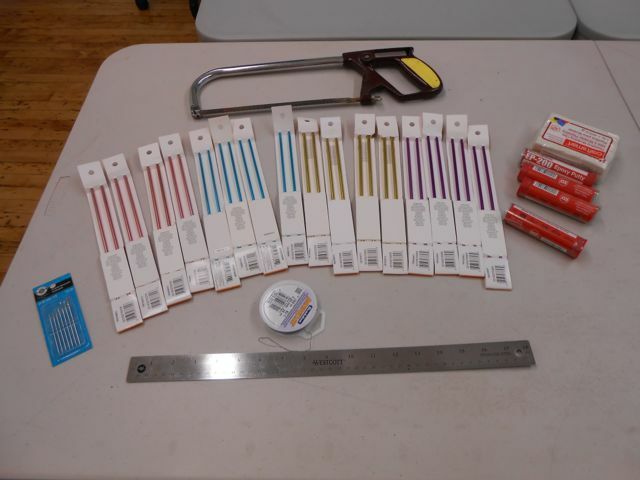 Here’s where the choice of temporary binding material becomes critical. 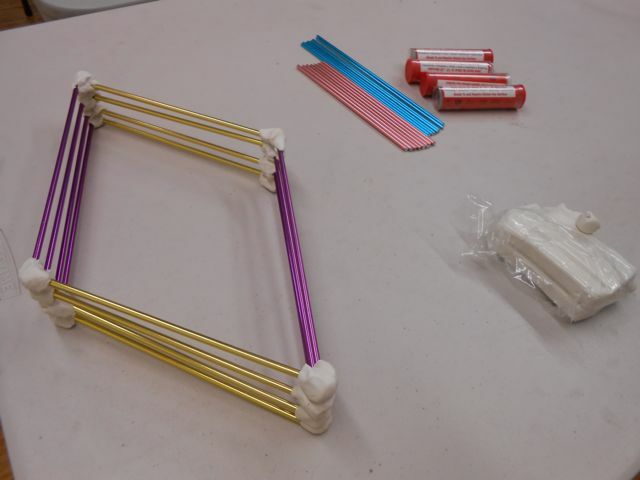 At this point in the process, the plasticine we were using had warmed up and had become too soft to hold all the rods in place well, so many hands were suddenly needed to hold things in place while the vertices were replaced one by one with the epoxy putty.